We woke up in our Airbnb and realized that we were really far away from everything, so we used public transportation – which is incredible – and got into the heart of the city. We started with the Eifel Tower (duh) and found ourselves buying one of those weird hot dogs from a street car nearby… seriously, who would think putting hot dogs and French fries in a baguette would be good? 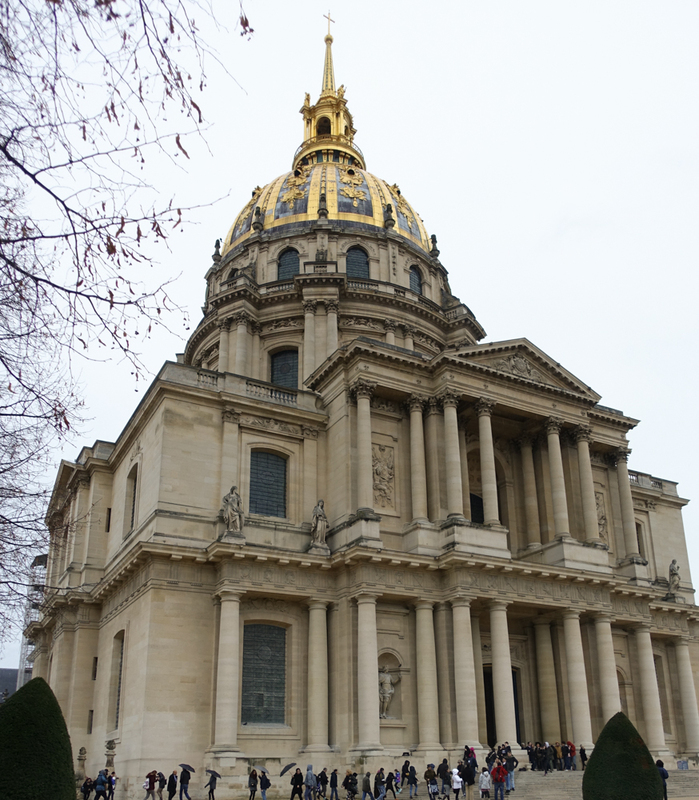 We though about going to The Louvre, but decided against it and went to the Les Invalides museum and The Army Museum. It was extremely fascinating and we saw exhibits on WWII, old armory, and the tomb of Napoleon. Afterwards we decided to get a hotel in the city so we wouldn’t have to travel so late at night since it was NYE. So we went to a grocery store, grabbed a bottle of wine, cheese, and crackers, and checked into our hotel. We enjoyed the small meal to take up more time so we could stay up late enough to enjoy NYE. Around 10pm or so we headed out and watched the Eifel Tower sparkle. Then we stopped for a very late dinner and a bottle of wine so eat up more time, and because we were hungry. It was delicious and the service was quick! Afterwards we headed to the Arc de Triomphe. 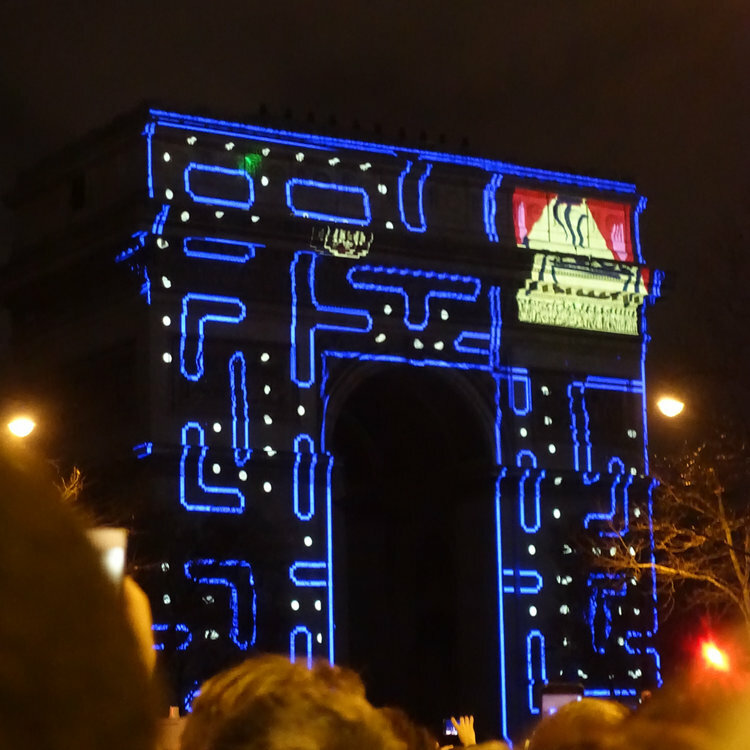 It took awhile to get into the gated area, but eventually we found ourselves crammed on the streets and watched the light show. It was the best NYE celebration I’ve ever seen and definitely tops the ball drop in NYC. 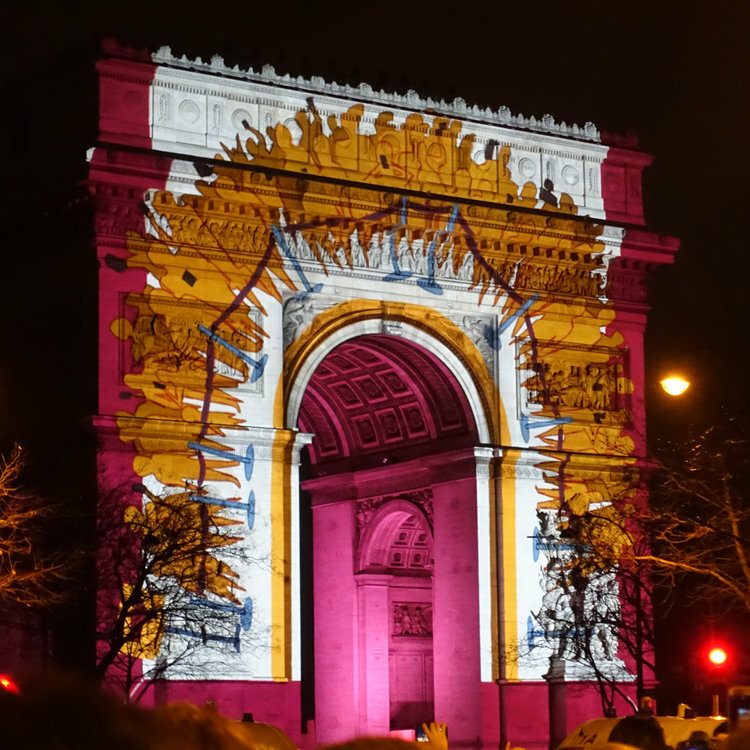 The lights were animations that were projected on the arc. There was a unique storyline that interwove the culture of Paris. 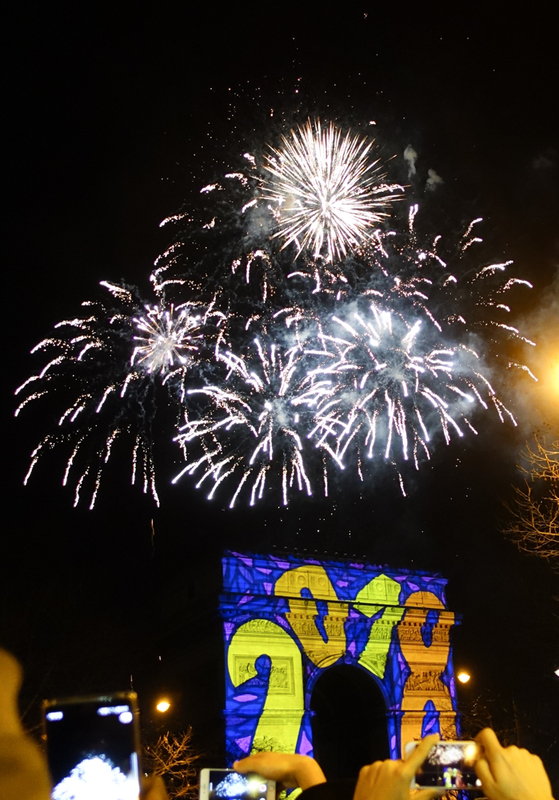 It was incredible and also displayed the final countdown and concluded with wonderful fireworks! It was a rainy day and almost everything was closed because of the holiday. We started at a café and enjoyed two crossants, tea and an omlet. We walked to the Louvre, thinking it was open just to find out it was closed along with all the other attractions and shopping. Still, we got a typical picture with the pyramid and continued on our way. There were Christmas markets still going on, so we walked along one and bought ourselves a box of macaroons. 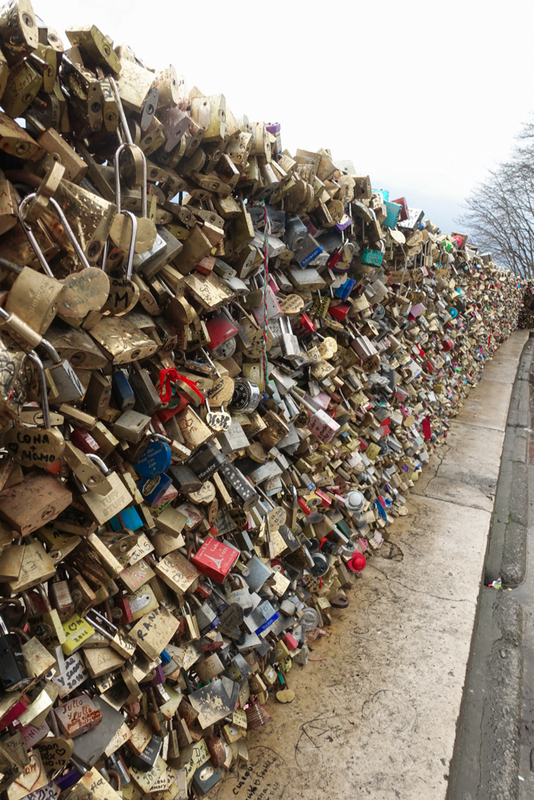 We stumbled on one of the bridges with padlocks and added our lock to the cluttered mess and threw away the key (Note: I say “one of the bridges” because it wasn’t the Pont des Arts, but there are a ton of places and bridges with padlocks on them). And that was it. Told you it was an uneventful day and we felt a little defeated as we returned to our Airbnb for the night. We got pretty good at walking aimlessly and found ourselves doing that most of the day while window shopping and exploring different parts of the city. We passed Notre Dam, but didn’t feel like standing in line and so we skipped it. Again, we thought about going to the Louvre but it’s closed every Tuesday. We did find amazing crepes, that were both savory and sweet. We had a banana nutella crepe since everyone recommended I try it (and I’m glad I did woah!!) and a savory crepe with goat cheese and walnuts. Yum! We decided to visit the Arc at night and sat there until we met up with my friend Shae and her French boyfriend. We got some drinks and ate at a French Bistro called La Rotonde. It was delicious and we got to try some new and fancy deserts! Our fourth and final day was mainly spent outside in the rain and standing in a line. 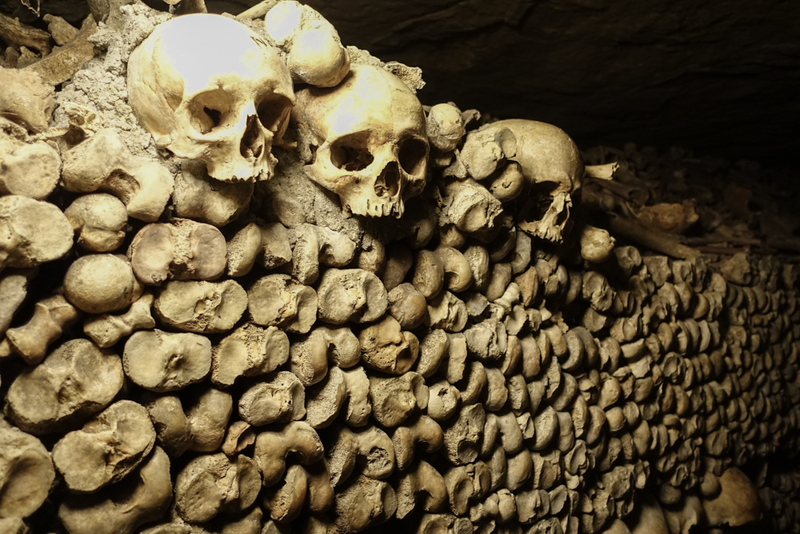 After checking out of our Airbnb and storing our luggage at the station, we finally made our way to the Catacombs where we waiting for over four hours to get in. We stood through the rain and cold, but it was worth it. Afterwards, we grabbed a quick bite to eat and caught the overnight train to our next day. - Look into hostels, airbnbs and hotels. o Prices vary a lot, but are generally more expensive here. Don’t stay in district 18 (aka where I was). Try to stay closer and google the area before you book because it might be sketchier than you expected. o Again, Paris has awesome public transit and this smart app helps a ton. It lets you see the bus and metro. Without the app, I think we would’ve found the system super confusing, but this helped a lot. We would just load it when we had Wifi and plan ahead and screen shot all of the routes we needed. o Like I said, they were delicious and you get to see them made right in front of you, which is cool. Specifically try a savory crepe and a banana-nutella crepe! o One of my favorite museums and a place I would never have considered. Give yourself plenty of time because there are a lot of cool exhibits if you’re into history and wars. o First off, it’s such a cool process. And second, it tastes amazing. We got it almost everyday and it’s pretty cheap! o Bathrooms are hard to find and when you do, you often have to pay for them. Even when they're in a restaurant that you’re already eating at. So have small euros and don’t drink as much water as you might be used to. o Street games, people selling selfie sticks… not worth your time or money. Don’t get scammed either! o Again, it’s a true French Bistro and will be expensive. However, if you get a glass of wine and a starter then it won’t be that bad! o It’s a little creepy, but super cool. Get skip-the-line tickets or be ready to be in line for a long time since they only allow 200 people in at a time. - GO FOR NEW YEAR’S EVE!! !